The index opened weak below 7900 and stayed in a narrow range of 50 points mostly wit a negative bias and closed in red at 7899.30, small loss of 12.75 points. The broader market was negative with 754 advances to 781 declines. The range for series is at 7500-8100. Call option 8100 added 12.03 lacs OI with profit booking seen at 8200 and above strike prices. 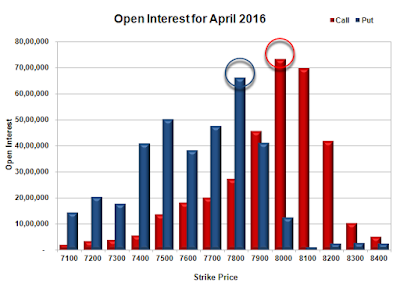 Put option 7900-7800 added 3.63 lacs OI with short covering seen at 8000 and above strike prices. 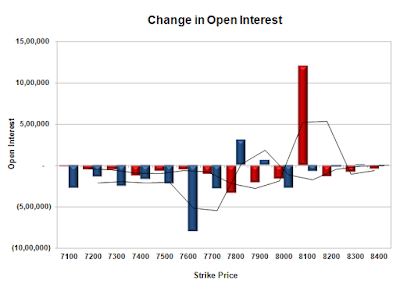 Nifty Open Interest is at 1,56,85,800 down by 2,85,675, with small decrease in price, most probably long liquidation. Bank Nifty Open Interest is at 19,02,960 down by 3,000, with increase in price, most probably small short covering. FII’s bought 9726 contracts of Index Futures, which includes net 5884 contracts long build-up and 3842 contracts short covering, with increase in net OI by 2042 contracts, includes 35430 longs to 25704 shorts for the day. FII’s Index future open contract as on date is 181455 Longs to 81752 Shorts, Net 99703 up by 9726 contracts. Initial and best support at 7800, with OI of 66.10 lacs and below that at 7700 with OI of 47.68 lacs. Initial and best resistance at 8000, with highest OI of 73.38 lacs and above that at 8100 with OI of 69.78 lacs. 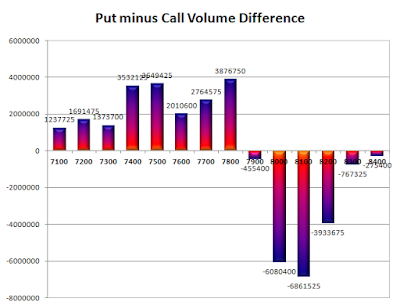 Day Range as per Option Table is 7833 - 7964 and as per VIX is 7832 - 7967 with 7899 as the Pivot.